Here's the thing: Across the Dentsu Aegis Network, we're increasingly sold on online video for our clients. We have done significant research on effectiveness, and the fact is, like-for-like ROI is 50% higher in online video than linear TV.2 When planning new campaigns for our clients, it's not a question of if we should shift investment to online video and YouTube, but where and how. 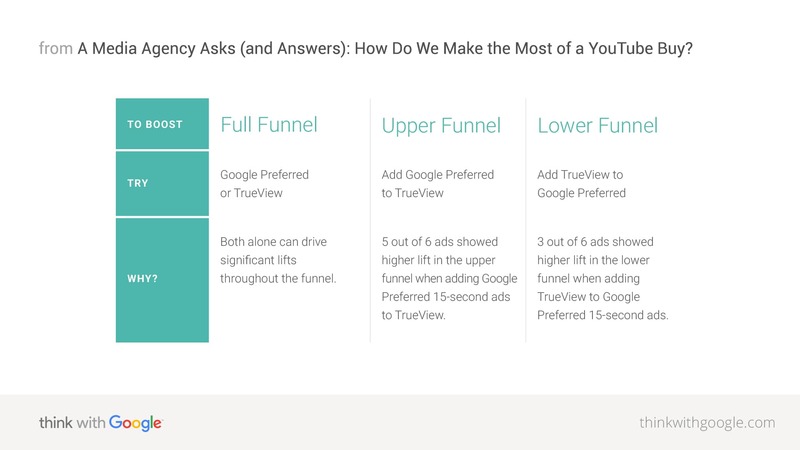 We partnered with Google to figure out how we should think about YouTube's two main ad formats: non-skippable Google Preferred 15-second and skippableTrueView 30-second ads. In a live controlled experiment, we showed the same creative from one of Dentsu Aegis Network's largest consumer packaged goods (CPG) brands to the same people in various combinations of the two formats; we also tested five additional campaigns from other categories to see if the CPG brand results were normal. Whether the campaigns ran only on Google Preferred or only on TrueView, the brands we tested saw significant lifts throughout the funnel. In a world where brands have more and more instruments to choose from to build out their orchestra, our experiment showed that both Google Preferred and TrueView can be the attention-getting horn, promoting brand awareness and ad recall, or a more subtle instrument, raising brand favourability and purchase intent. We think of Google Preferred lineups like Food & Recipes, Music, and News as interest-specific channels like MTV, Comedy Central, or TLC. This valuable inventory with YouTube's most passionate audiences not only extended the reach of our client's campaigns, but also had a strong impact on the upper funnel when added to TrueView-only campaigns in our test.